The Unionville varsity baseball team captured the annual Stomp in the Swamp trophy by defeating Kennett 18-7 on April 11. In a game that is advertised as a yearly contest between neighboring Kennett and Unionville high schools, the team from the northern end of town turned out to be the neighborhood bullies. Backed by solid hitting by Alex Pechin, Jon Karas, Eric Takoushian, Nick Ward and Ryan Barrett and four innings of solid relief pitching by Tucker Reese, the Indians defeated the Blue Demons 18-7, in the annual Stomp in the Swamp meeting of the two teams. 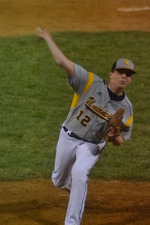 In a game held under the lights at the NVF Senior Field in Kennett Square on April 11, the Indians jumped on Kennett starter Joey Pannell early, on a lead-off double by Pechin, who later came around the score on Ward's to right field. After a solo homer by Karas cleared the 330-foot sign in left center to make it 2-0 in the second, the Indians jumped all over Pannell in their half of the third, scoring 7 runs on only three hits. After leading off the third with a HBP, Ward later scored on a bobble by Kennett shortstop John Burns, who attempted to force Dan Garver at second on a Matt Foster grounder. Karas then walked to load the bases with one away, which was followed by a line drive single to right by Tokoushian, bringing in Garner and Foster. After Karas scored on a ground out by Pechin and Chris Koehler was walked, Pannell was lifted in favor of pitcher Greg Badis, but the damage wasn't over yet. Ward's pop-up near the pitcher's mound was misjudged by Kennett catcher Ian Slicer, scoring Takoushian to make it 8-0. 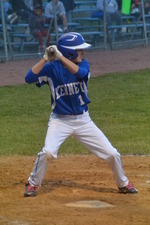 Andrew Jones then lined a single to right, scoring Takoushian to finish the scoring for Unionville in the third. runs on four hits, including four consecutive hits by Zach Ploener, Joe Zirolli, David Villafane and Ian Slicer, whose solo homer to left center chased Foster, the Unionville starter. Despite surrendering two more runs in the fourth to Kennett, Reese spelled Foster effectively for the remainder of the game, shutting down the Blue Demons in the last three innings, while contributing to an offensive attack that tacked on additional runs. In the fourth, Pechin's two-out triple brought in Takoushian and Barrett who had singled and doubled ahead of him, and in the fifth, Reese's double to left drove in Ward, which was followed by a a Barrett single that plated Foster to make it 14-7. The Indians closed out their scoring in the 7th on singles by Karas and Koehler, and a two-run double by Ward. With the win, Unionville now holds a 4-2 lead in the Stomp in the Swamp trophy game, while improving their record to 6-3. With the loss, Kennett fell to 3-6, but rebounded the next day with a 15-11 win over Sun Valley.